You are here: Home › Cover Crop Benefits › Cover Crop Challenges › Timing of Planting › Education › Cover Crop Research › Is it Ever Too Early to Plant Cover Crops? Is it ever too early plant cover crops? YES. As many of you have figured out, I sell seed for a living. I also have been a farmer or involved on the farm since I was a little boy. But first and foremost I am an agronomist. 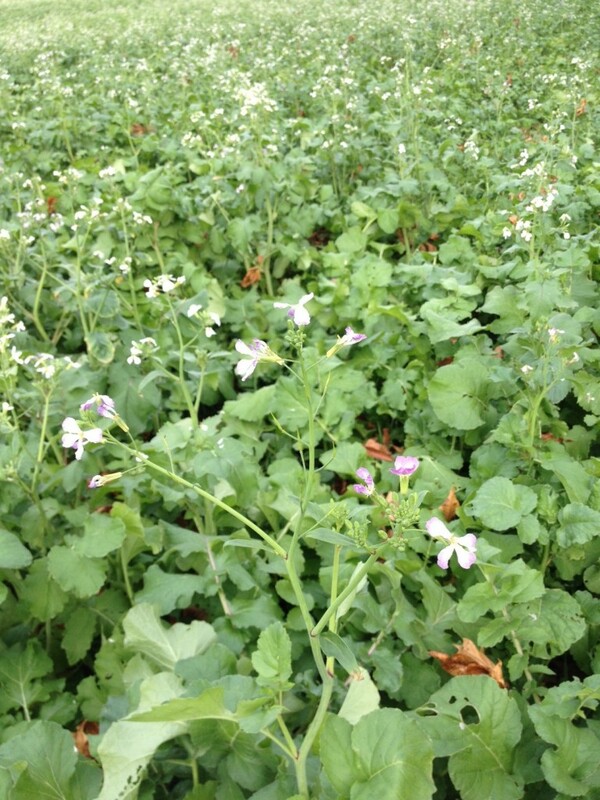 The temptation of a seed salesman is to recommend planting a cover crop either too early or too late – and then somehow justify it. However, as an agronomist and a former farmer, I simply cannot do that. I also want to be able to look at myself in the mirror without guilt. Cover crops have to work for the farmer, not the seed salesman. There are several fantastic seedsmen out there and I do not want to disparage that fine profession. I feed my family by being a seedsman and marketing seed. Most seedsmen are a trusted source of information and quality seed. 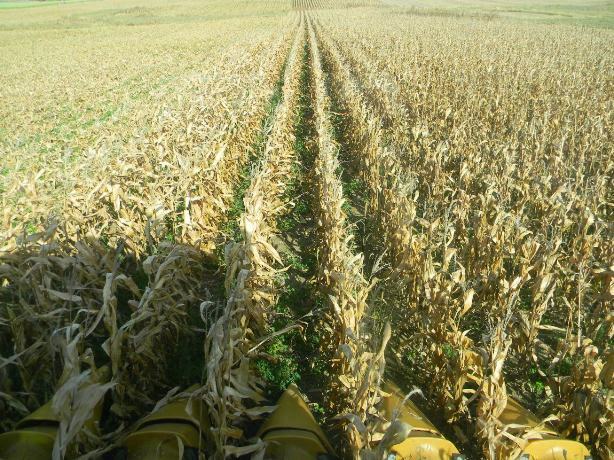 How soon can a farmer plant cover crops after wheat has been harvested? Can a farmer plant clovers into corn at “the last cultivation?” (even though only a few farmers still cultivate). When is it too early to plant radishes? When is it too late to plant radishes? Money has not always been good in agriculture and I doubt that this current boom will last forever (it never did before). 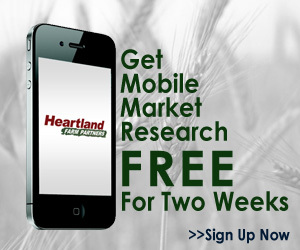 So I want to give answers based on sound agronomic practices that will work 90% of the time. Question: Can you plant crimson clover at “lay-by”? Yes you can. My granddad did that practice back in the 1950’s. Of course he planted in 38″ rows with 16-18,000 plants per acre. He did not use herbicides but he did cultivate. However, how many of us farm like my granddad did? A few of you might – with good reason to do so (specialty corn or organic production). But, can it work with modern herbicides and plant populations pushing 35,000 plants per acre? Maybe, but not consistently – and probably not. I think I tried to say “no” but I’m aware that some farmers have done it. But, can we do a practice if it is not going to work 90+% of the time? Not on a large scale. Can we afford to try it on a few acres? Maybe. Here is a northeast Indiana farmer’s testimony of his success spreading crimson clover into his growing corn at sidedress time. I am sharing this exactly as it was sent to me – trusting that it is accurate. I do not know the farmer who submitted the testimony. I broadcast 10 lbs/acre of crimson clover at sidedress time this year. I seeded it on 6/6. We got essentially no rain from the first week of May until the last week of July. I figured the clover wouldn’t grow, but it laid there until we got rain and by harvest we had a nice stand. I’m not sure how this would work in a ‘normal’ year, but it sure worked good this year. I left some check strips and the clover didn’t affect the yield. The seeder was just an old 12V spinner seeder I clamped onto our N toolbar. I’m attaching pictures of it and the clover stand. My guess is that this farmer used only glyphosate and no residual herbicide. It was also terribly dry this summer and this seeding would have been more like a “dormant seeding”. This was not at all typical for an Indiana summer. It was the driest July on record and June and August were also very dry. Note how short the corn is in the photo with the corn head. There was a lot of corn 3-5′ tall this year in Indiana. I’d guess that a 5 foot height would cover the corn height in this field. If the crimson would have been planted in a “normal” year I would be surprised if he would have had success like this. But, boy, it sure is a beautiful stand in these photos! If you try this practice, just experiment with a few acres to see what works on your farm. Seeding Crimson Clover at “lay-by” in June in NW Indiana. Note how short the corn is in the photo. Contrary to the belief of Illinois and Iowa farmers, this is not typical for NW Indiana corn! Most likely the rains that came in August were adequate to germinate the clover and there was plenty of sunlight getting to the ground so the seedlings had heat, moisture, and sunlight. What a beautiful cover crop! Here is a beautiful stand of crimson clover between rows of harvested corn! Unfortunately the lack of corn fodder shows that the corn was under severe stress in 2012. 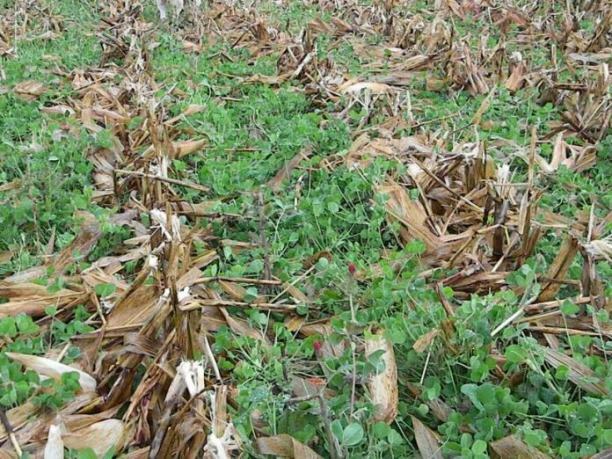 While achieving a nice cover crop is important, I would prefer 200+ bushels/acre corn and a less advanced stand of clover at harvest time. Question: Can you plant radishes right after wheat harvest? Even if you use an excellent radish, it will bolt. I don’t care which radish you use – it WILL BOLT if you plant it too early in the summer. Bolting means that it will try to produce seed. Generally a radish that bolts has a smaller and shorter tuber and most of the plant energy goes to seed production instead of root tuber production. If you wait until early August and use the proper radish you will see very little if any bolting. I have been in several fields this fall that had no plants bolted. I have also seen many fields that had a high percentage of plants that bolted. Some claim that the exceptionally high soil temperatures in the summer of 2012 caused the August planted radishes to bolt. That may be the case. One thing I know for certain, if a radish is planted in July, it almost always bolts and can produce viable seed in the fall – and that could create potential problem for years to come. Wait until August to plant your cover crop radishes. Use the few weeks between wheat harvest and planting cover crops to clean up weeds that were in the wheat field and also control volunteer wheat. Patience is a great virtue. It is important that you see an excellent return on your investments that we make in cover crop seed and seeding cost. Our goal should not be “to be done first” but rather to have the best cover crop and healthiest soil. I hate seeing fields like this as I know there was potential for seed to be produced and dropped to the soil possibly creating some issues in future years. Was this field planted too early or was the wrong radish planted? I do not know but I do know that farmers should chose wisely on planting time and what radish to plant. Thankfully not every plant bolted so there are still plenty of plants “doing the radish thing” in the soil very well. 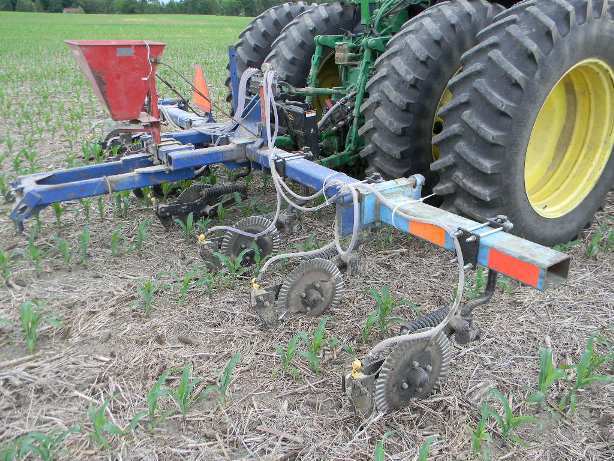 4 Responses to Is it Ever Too Early to Plant Cover Crops? Ben, this spreader or one like it can be purchased at many farm stores. Most in my region are from the Herd Company. Herd Spreaders and those like them are super handy and not too expensive. Interseeding at V5/V6 is proving to be “risky” and less than reliable. You would have to use glyphosate tolerant corn and virtually no residual herbicide (although check with your chemical rep). If you try crimson clover you can use a grass herbicide and glyphosate. Again, check with your chemical rep. Best of success!